Sunday Sequels is a meme created by Amber Skye at Reading Addict! Every Sunday I will make a post about a sequel I can't wait to read. This week's Sunday Sequel is Haunted by Joy Preble. Anne Michaelson’s world turned upside down last fall when a handsome, blue-eyed and temporarily immortal Russian named Ethan informed her that she had a destiny to save the Grand Duchess Anastasia Romanov, held captive for decades by the witch Baba Yaga. But Anastasia had her own thoughts about destiny. And Anne and Ethan discovered that some things aren’t so easily undone. Now, six months later, the craziness in Anne’s world hasn’t gone away. Neither have her feelings for Ethan. Anne still has powers she doesn’t fully understand. She’s still dreaming about Baba Yaga’s forest. And she’s got a new boyfriend – very normal and very sweet lifeguard, Ben Logan. As for Ethan, well, he hasn’t quite gotten over the events of last fall, either. And he definitely hasn’t gotten over Anne. In short, everyone’s haunted by something – or someone. Enter the rusalka – a Russian folklore mermaid with a malevolent streak - and a particular interest in Anne. When Ethan suddenly returns from Europe, Anne’s world collides with the paranormal once again. Her heart torn between Ben and Ethan, Anne’s search for the rusalka’s identity reveals deep and startling secrets - including the true source of Anne’s powers. Like Dreaming Anastasia, HAUNTED is a wild adventure of a tale, a genre blend of fantasy, folklore and romance alternately narrated by both Anne and Ethan. As lives and fates intertwine and the romance heats up, so does the danger. “Stories within stories,” the rusalka tells Anne. “Secrets within secrets.” And as Baba Yaga frequently observes, nothing is as simple as it seems. I am reading Dreaming Anastasia by Joy Preble at the moment. Dreaming Anastasia is the first in the series which is set to be a trilogy. 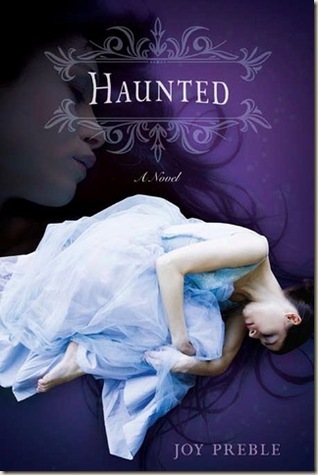 Haunted is the second book, due out on February 1st, 2011. Although I haven't read much of the first, it seems like an intriguing story and I am interested in learning more. Luckily, I have been added to an ARC tour for the book. Haunted arrived this weekend, so I will be all steam ahead reading both books this week. I will hopefully have both reviews posted by next weekend also! Hopefully you'll enjoy this one more than its prequel!